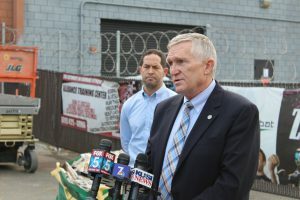 After a City inspection, officials determined that a parkour training facility where 21 children and two adults were injured last week had many building code violations on its premises and throughout the building housing other businesses as well. On Saturday, Nov. 11, a large group of children ran up a flight of stairs into a second floor deck at Vault PK, a parkour gym, to stand in line for pizza at a birthday party. Moments later, the structure the group was on, which was described to not be “constructed correctly,” collapsed. On Thursday, Nov. 16, Michael S. Richmond of the City’s Code Enforcement Department spoke with media about what inspectors found inside the facility housing this and another three businesses. According to Richmond, the uses and occupancies for this building were never changed without the required permits to establish the current businesses. Code Enforcement issued a notice of violation at 1 p.m. on Thursday, hours before the media address. The notice outlines all current violations and the correction requirements needed to be made by MTS, the party responsible for the building. Among the code and permit violations found throughout the multi-business building this week were a lack of emergency exits, a lack of exit door signs, a lack of maintenance to fire rated separation walls, locations within the building which aren’t covered by the sprinkler system, a severely damaged column which supports the roof structure, and unpermitted structural work at all businesses, among others. City documents reveal that the warehouse was built in 1962. The last-issued construction permit for this building was processed in 2004 to then-tenant NASSCO. This permit was to “remove and add partition walls”, creating the current building configuration, and was satisfied with approvals and inspections. According to Richmond, the San Diego Fire Department does periodical inspections of commercial buildings in the area on a yearly basis, reporting any instances of code violations directly to the Code Enforcement Department. He also added that while there have been no previous cases of reports, he is not sure if fire inspections have been done recently. “We have every reason to believe that those measures will be taken by the responsible parties and we anticipate that they will be moving forward at a rapid pace to get compliance on this situation,” Richmond stated. The MTS-owned building, which occupies addresses located at 1699 and 1677 Main Street and 1012 Sigsbee Street on the edge of Barrio Logan, is also host to an indoor paintball park, a mixed martial arts training center, and a crossfit gym in addition to the parkour facility. Building management has until Dec. 20 to fix any noncompliances and to file the correct permits. Any noncompliance will revert the building’s occupancy back to a warehouse.